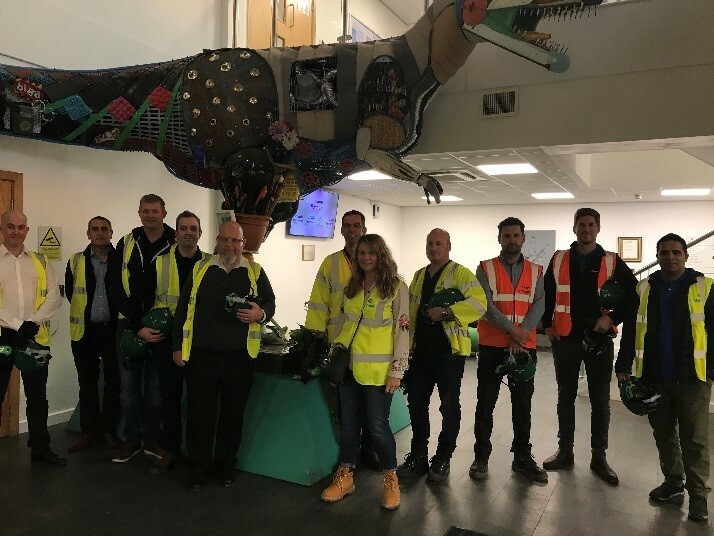 On Wednesday 14 November, 23 members of the MHEA met at the Park & Ride in Bicester and enjoyed a car share to Viridor’s energy recovery site at Ardley ERF, in Oxfordshire, where they were met by Jessica Baker-Pike, the Learning and Visitor Centre Manager. Ardley ERF began operation in 2014, treating 300,000 tonnes of non-recyclable waste each year. It diverts at least 95% of Oxfordshire’s residual municipal waste away from landfill and generates enough electricity to power around 38,000 homes. The site includes a visitor centre to encourage people to learn more about the process, which is where the MHEA visit began. Following the Health & Safety presentation and welcome tea and coffee, the tour split into two to take a tour of the facility and hear a technical presentation about the energy recovery facility. The presentation focused specifically on how Ardley ERF produces base load electricity and construction products from residual waste. It also included wider aspects of the Viridor business, sharing images from their online gallery, which generated a lot of interest. As well as treating household waste on behalf of Oxfordshire County Council, the facility also receives residual waste from local businesses and other local authorities, helping them to divert their waste away from landfill. It was built next to an existing landfill site, which was closed after 35 years so that non-recyclable waste can be used as a resource at the EFR instead. Viridor is committed to engaging with the wider community about the need for energy recovery technology, working in partnership with the waste hierarchy to reduce, reuse and recycle waste. The second part of the visit was a tour of the facility, showing the residual waste treatment process from start to finish with aggregate product as the output. Members found this particularly interesting. It provided greater insight into the needs of the energy recovery industry as a whole, and the challenges the bulk materials handling industry can endeavour to meet. The MHEA exists for its members and we are ready, willing and able to share your news and updates in this newsletter, on the website and on Twitter. If you have a marketing team or PR agency, please forward them this newsletter and encourage them to share your news with fellow members and the wider industry. The MHEA marketing channels are free to use for all members. Many of our members will know or have spoken with Julie Claus, who is part of the MHEA secretariat. She has worked tirelessly on behalf of the MHEA for over seven years and is now leaving us, for pastures new. Those familiar with BULKEX and our site visits will have seen Julie put her best foot forward in every circumstance and provide unstinting service to members and the executive committee alike. Julie has played a valuable role in moving the MHEA forward and she will be sorely missed. The MHEA has today announced a site visit to the British Steel site at Scunthorpe to see the highly regarded integrated steelmaking site on Wednesday 20 March 2019. The visit will include the coal handling plant, and observing coke oven batteries pushing coke; the ore prep plant to observe ore blending and associated operations; the caster operation; the Rail and Section mill; and Rail Area 3 to witness the handling of 216M lengths of rails and loadout. This is expected to be a highly useful and informative visit to the British Steel site, with numbers limited to due to health & safety restrictions. Members are encouraged to register their interest as soon as possible by contacting Teresa secretary@mhea.co.uk or by calling her on 01787 226995 and find out more by visiting https://britishsteel.co.uk/.